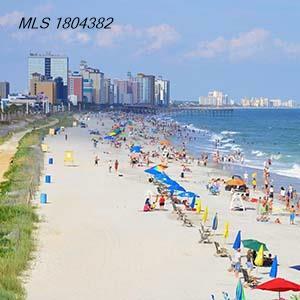 This is one of the most luxurious buildings on the Grand Strand. Overlooking the Dunes Golf and Beach Club Golf Course #10,11,12 and the natural salt marsh estuary. On top of the building you can enjoy a large terrace with views of the Atlantic Ocean and beautiful sunsets to the west. This is a gated community with secure entry into the building . Indoor swimming pool , workout facility and an owners lounge are also part of the amenities that are offered here. This is a two story floor plan . All three bedrooms are on the second floor . There are stairs or a private elevator that will take you to the second floor. This beautiful Cooks kitchen is equipped with Viking stainless steel appliances and a Viking gas range. Plenty of cabinets and counter space where one can prep on the custom Red Imperial Granite . Travertine Marble is in the Kitchen, Laundry Room, Dining room,and all bathrooms. Enjoy a large living space on the main floor with 9.5 ' ceilings which flows out to a 24' wide balcony with spectacular views. There is a wet bar on both levels and a six zone distributed audio system throughout the condo. Owners can have a golf cart and the beach is just a two minute ride away. This is the unit you have been looking for.